Everyone’s favourite training tyre (formerly known as Ultra GatorSkin). The ONLY tyre you ever need. Excellent raining tyre with the weight and performance of a summer race tyre. I feel confident with these tires knowing that my chances of puncturing are quite low. These are sold over $80 CDN here. Got them for just Under $40 CDN. Nice! These are the only tires that I use. I have been using them on my bike since 2014 and have never had a puncture. They last forever and really handle well. While they aren't as light as other brands/models, I gladly trade the weight for the peace of mind. I won't ride on anything else. The only tire I regularly ride for my commuting bike. These things are essentially bulletproof. Best tire out there. Here in the states one tire is the price of two tires and shipping. Great service from Merlin as usual, with super quick delivery. GatorSkins are my preferred all year round tyre! If you wish to minimise the chance of punctures buy these. However they do slow down your speed, being heavier than "racing" tyres. The best way to think about these tyres is that one puncture will lose you 10 minutes or more. The extra exercise you get from pushing harder is also beneficial! I have had just one puncture in 10 years. Great tyres, good for tens of thousands of miles. The tyre rolls nicely. I ride a lot and the numbers of punctures I get went down since getting these. As usual reliable and faultless performance. Just put a new one on but older tyres just last and last with no punctures and only wear out when I have to do emergency stops and put a flat spot on them. Good grip and good rolling motion highly recommended. Great tyres. Long lasting and good puncture protection. On my 4th set. Huge fan of GatorSkins, keep them in good condition nd you will avoid all but the absolute most unavoidable of flats. Love the grip on the road. Gives you good rolling motion. Excellent tyre, excellent price, excellent service. These are just about bullet proof especially for winter and nice rolling resistance. These tyres are bomb-proof. I rarely get punctures, and I mean 3-4 punctures over 3 years, and even then they from long sharp pieces of wire or very long "cat's eye" burrs. Recommended! Very good tire that carries from commuting to practice. I feel deterioration of side casing when used for a long time, but in that case recommend replacement. Because the price is also cheap, it seems that you can minimize the risk of puncture if you decide the distance and duration of use and use it. The best summer commuting tire. Merlin had the best price. As always a great product at a great price. I only buy Conti tires and Merlin cycles is the best price on this brand of tire. Minimal flats with this tire. The folded tires are tad bit easier to put on the rim than the non folding. Roads in Brazil are atrocious and puncture resistance tyres are a must - unless you want to deal with flat tyres every ride. This one endures all kind of wires/detrits/holes that usually we have in highways. I never had a puncture and they roll very nice. To my brazilians colleagues, I highly recommend this one. Good tire on dry and wet roads. Was hoping for less flats, but they ride well and the mileage is good. The only tyre I will ride. Had many sets go over 5,000 miles, some with never a flat. Many rave about the Conti 4000sII (my new BMC came with them) but I have experienced many flats and short life with the 2 sets I owned. Only been out for a couple of rides on these tyres but found they rolled a little quicker than my previous Maxxis Rouler maxx shield. However, they are a fairly tight fit and refitting them out on the road in the middle of winter might be an issue. Excellent road rubber indeed! I ran my old pair on my commuter hybrid for almost six winters! Fantastic. Hardly have flat and recently changed to from 23 to 25 for more comfort and more grip on the corner. Repeat user of these tires. Especially good on the open road heavy chip seal we have in New Zealand. Best value for money and lasting preformance for longer distance endurance / training rides. Recently received my tyres and have ridden about 150 miles. I have friends whose bikes are equipped with this brand and have lauded their riding qualities and resistance to puncture. Although I haven't ridden a great distance I can say that the tyres roll great and I'll have to assess their impenetrablity later. Otherwise I'm pleased with them. Can't fault them. Never had a puncture with these tyres. I am a fan of the Gatorskin durability. Easy the install surprisingly as it is a large size tyre..havent tested yet but it looks promising for puncture resistant. Lightweight, and most importantly offer excellent grip in the wet. Best winter tyres in my opinion. The 28c size gives great comfort and grip on dirty, rutted winter roads with little, if any, adverse impact on rolling resistance. Throughly recommended. Excellent product. I have used Gatorskin for years and it's a personal favorite for flat protection. I am always willing to sacrifice some weight to rarely have flats. Good tire, bought the 28mm width, wider is the way to go. Good grip, pretty light, good puncture resistance. Pretty balanced tires - good (not best) in every aspect. Always a top notch tire, perfect for anyone who doesn't want to dink around with flats or can't afford to be sidelined. Mounts pretty easily on my Stans Alpha rims. Bomb proof and always achieve good mileage. Great all round road tyres that last a long time (lots of kms) and are pretty good at resisting punctures and at a good price on Merlin. 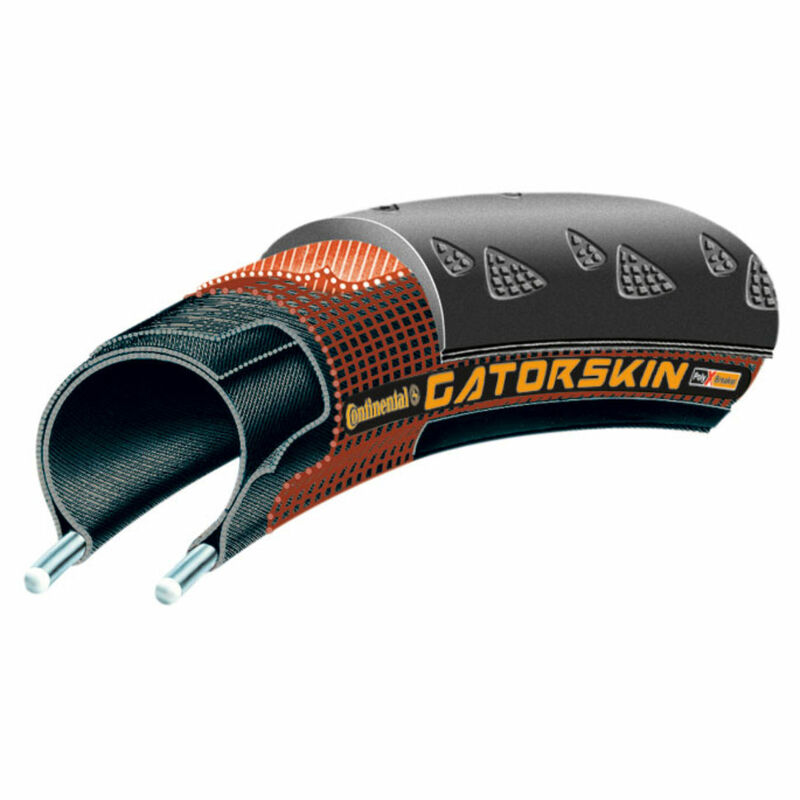 I ride 8000+ miles per year and I can't remember the last time I had a puncture with a Gatorskin. The best road bike type for those who value puncture protection over supple ride quality. If you ride on pretty decent roads for the majority of your riding, then get the 4000s Conti Tyres. For everything else, these are the key! Got these in 32c to replace some Marathons on my commuter bike. They seem good so far - certainly seem to roll better. The ride seems a little firmer, but not by much. Gatorskins seem to get mixed reviews in the narrower sizes, and I'm not sure I'd have them on the road bike, but as a commuter tyre they're great. I went the 700x28c combination this time round from the typical 700x25 that I had been running for years. The ride is much more comfortable as I can ride with lower pressure, but as the surface contact is the same, I don't notice any rolling resistance. The benefits of the Gatorskin tackiness and puncture resistance keep me buying these time and time again. The only issue I have is that when ridden in the wet, is that glass and other debris that comes to the surface can stick to the tyre and eventually pierce it. Wouldn't use another tire. Excellent in summer and winter, and so incredibly puncture resistant that shards of glass can remain lodged in the rubber without puncturing the inner tube. Durability with consideration for grip is unrivaled. Normally buy the beaded gatorskins but these were such a great price (only a couple of pound dearer than the beaded) that I had to get them. Much lighter than the beaded and slightly easier to fit. If they're anything like my previous Gatorkskins I'll get at least 2 years puncture free riding out of them! Awesome tires! I've had a pair of these for about 5 years and am only now replacing them! Quite hard to get on my wheels, but comfortably burly so I don't worry about flats. Strangely I did once blow out a sidewall on one of these tires, but Continental was really great about the warranty and I got a new one for free. A very effective training tyre excelent puncture resistsnce & durability. The toughest decent road tyre you can get, without compromising grip and feel too much. This is the third and fourth pair of Gatorskins I've bought. The first pair lasted 9,800km the second pair will certainly make it to 10,000km with the wear indicators still visible. I rotate them once after the first 2,000km or so. Merlin is the best place to buy these. I use a 25 mm GatorSkin tire on my rear wheel and haven't had a flat since. I haven't noticed any change in rolling resistance in sprints or climbing. I couldn't recommend this tire any higher. Using it on the front wheel maybe an overkill, so I use a lighter tire for that purpose. Probably the best all round road tyre on the market. Ive done thousands of miles on these over the years. Tried many others but keep coming back to the gatorskins. Just replaced my rear tyre following a cut that most tyres would not have survived. Grippy, tough and lasts - easily the best bad weather tyre I've tried. These tires are definitely slower than most, but the peace of mind they provide is absolutely wonderful. I mounted these right away and put them through 50 miles of the worst roads I could think of. Where my other tires fell flat (literally) these keep rolling and rolling. Like I said, they are very very good for group rides and solo commutes, but if you are racing I say find a faster tire for that. Never had any problems with any Continental tyres on road or mountain bikes. You get what you pay for. These are relatively light and roll well with good grip. These are currently my favorite tires. I was riding the GP 4000s but kept on getting flats. After a while I was fed up with flat tires and switched to Gatorskins. I've only had one pinch flat in the past 7 months, but that was from hitting a huge pothole at nearly 50kmph. I've been buying gatorskins for years, very hardy. I've been using these tyres for a while now, seem to grip really well and survived riding over some broken glass that I didn't see. Great tires, have been riding Gatorskin for years and have had very few flats or punctures compared to other brands I've tried. Merlin had good service and shipping as well. Best price I could find, even with shipping to the U.S.. Gatorskins are the only way to go. This was my 8th pair and I rarely have flats after changing to them. My last flat was over a year ago and it was from a broken valve stem, not tires. Great tire. Can be a pain to put on a rim. Rode a whole season in Conti GS with only one flat, hope I can do it again! Excellent tyre, use them all year round. My goto bad weather tyres, last well, grip well all at a competitive price point. Superb winter tyre, excellent grip and its good to have peace of mind that punctures are at a minimum. I also use the GP4000s II and find these are very close in performance. Great tyres at a great price from Merlin. It is the hedgecutting season in my area. Thorns all over the place but once again Conti Gatorskins do their job and I am riding puncture free and with plenty of grip on the wet and muddy lanes. Excellent tyres and excellent value they will certainly see me through the winter...and perhaps next too. Who knows? I have done almost two thousand kilometres on a set of these tyres and not one puncture yet. That is riding in and around Paris including cobbles and some fairly rough bits at times. Very happy with these tyres and fingers crossed lots more puncture free riding. Bought these as already have a pair on another bike and have been very pleased with the puncture resistance. Would recommend for all year round use. After terrible experiences with the tires that came with my bike I decided to go with Gatorskins --3 years without a flat ...excellent training tire . I use them on my road bike. They are perfect for me because I have 2 km of gravel before tarmac. Been using them now for about 1000km and still no puncture. The comfort is really good also with the 25 mm. My favourite tyres I've tried. They seem to last for a good 1000 miles + and feel assured in wet slippery conditions. First ride on them today and had been on some Bontrager All Weather 25mm and too be fair they were pretty bomb proof until last couple of rides when I only had to look at them and they puntured but had covered over 2000 miles so fair enough. These tyres today were great and such a difference with the way they rolled and gripped. Excellent for climbing and made such a difference to my ride. Love them! Excellent price, service and product as ever. Tried Conti GP4000's but got fed up with punctures, plus find the harder compound of these actually quicker. Possibly psychological, but anyway.. nothing slows you down like a puncture! Seem like solid, durable tires. Only been commuting on them for a couple of weeks in Edinburgh where there's a lot of glass. Also used for 100 milers and these roll well. Don't seem to suffer the little slices and cuts that Michelin pro race 3s and 2s suffered. Perhaps not quite as grippy as more 'race oriented' tires, but more than compensate with their durability. Super quick delivery - not sure how Merlin do it! This is great winter tyre. Have already had to test it out in typical autumn weather and it has been good. It Inspires confidence as you splash down lanes liberally covered in gravel, hedge trimmings and diesel. Looks good as well with the visible red mesh on the sidewall and the yellow 'Gatorskin' logo. Merlin, as ever, gave me the best price and a great delivery response. Thanks. When I wanted a more durable tyre to replace the excellent GP4000s on my training wheels I went straight to Continental. I already have these on my commuter and (sssh) no sign of the p word and little visible wear in 12 months of 50 miles a week through Bristol. No issues with grip either. Have had several sets of these tyres which give superb puncture protection and durability. This is at the expense of a little bit of suppleness in the side wall and so they are not just as smooth and soft a ride as some other 25 mm tyres. This is noticeable between these and the Michelin Pro 4 Endurance, which I have also tried recently but I cannot comment and compare the durability of the latter. Cannot really fault the Contis though as they do what they say they are designed for at a very good price point. What can you say about gatorskins that hasn't been said before? I ride them all year round because I hate punctures, and, to be honest, all tyres feel more or less the same to me - pressure makes most of the difference. Quite light, ride nicely, hardly any punctures. I've bought a total of 6 - only one was duff where the bead failed and ripped the tube. The rest are all rolling along no problem. Fantastic general purpose tyre. Pretty light and roll well.! Was suffering loads of punctures but none since I put these on. As ever top class service from merlin. !